Building a successful app is as challenging as hiring mobile app developers with desired experience and skills. However, with the progression of technology, we cannot ignore the advantages of these mobile apps for the businesses. In this fast paced world, we all want to perform every task as soon as possible. Mobile apps are the best alternative for doing everything in just a few clicks. If we talk about in business perspective, these apps allow you to expand your business roots all around the world. This is the key reason why everyone wants to know the best mobile app development company. Nobody wants to stay behind in this rat race. Today, in this blog, I am going to address those, who are planning for creating their own social media app. If you are one of those, then scroll down to the next section and find a few useful methods to build a mobile app for social media. Keep all these points in mind and get a successful social media application. When you have decided your target audience, it is suggested to make feasible estimations on your social media application improvement. One of the most essential things to keep in mind while developing your mobile app is your budget. A decent social media application improvement takes a specific cost that your organization must have. The subsequent stage is to choose that on which platform you need to use your mobile app, whether you want it for iOS or Android. The most prevalent social media applications are on iOS OS. Therefore, you can also consider building a social media app for iOS initially taken followed by Android. Each user wishes to feel unique by displaying its own personality to the world. Therefore, make sure that you give opportunity the users for self-expression so that, they can show how creative and extraordinary they are. Your social media app should contain some common features, such as customization of profile pictures, putting nicknames, background details, etc. Mobile app development process is long and demands a lot of skills. Therefore, it is crucial to always follow some useful points and this is one of them. 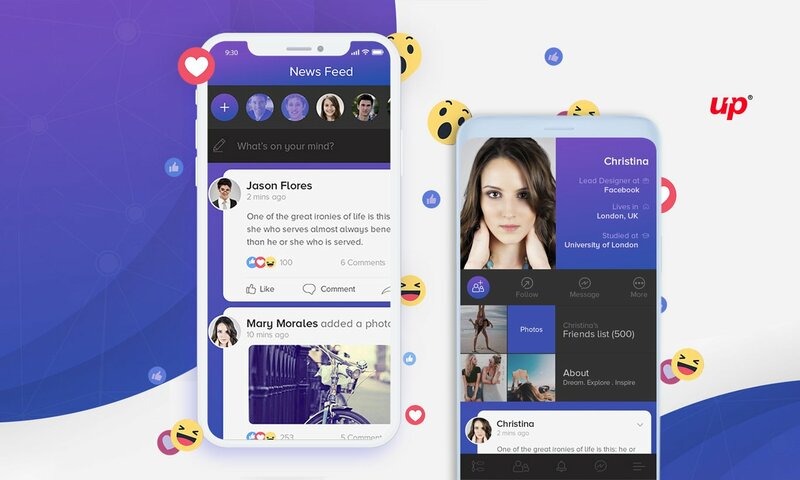 We all know that the key purpose of a social media app is to get to know new people or connect with the old friends or relatives. Hence, social media application developers utilize the perfect algorithm, in order to follow an accurate friends’ graph. Moreover, your app should allow them to invite or add their friends with the help of a single click. The news feed option is available in almost every social network. Users create a huge amount of content themselves, including statuses, check-ins, photo, video, audio, etc. Moreover, sometimes they get ideas with these news feeds to write something extraordinary. We all know that one of the advantages of the social network is to express our thoughts and ideas. Therefore, designing an app consider this point would bring a large number of audience to you. Regardless, your awesome experience of public user communication, something is always left to discuss in private. Keeping this in mind, it is essential for a social media app to consist of built-in services for safe and secure private conversation. In this way, your users will not opt for any third-party resource and devote their time in using your application. There are certain general standards based on which you need to build all the web pages of your social media mobile app. There are three must have columns that you have to consolidate in case you want to have an effective and proficient app. Customer Benefit: Partnering with a facilitating organization can change your life. They will manage specialized issues and some other issues identified with your platform. Commitment is the word, which is generally associated with the advertisers. Gone are the days when the utilization of social media was only done for communication purpose. Nowadays, social media marketing has also become essential to make an app successful. Therefore, it is recommended to import and provide arrangements for your committed users. They can become your vital clients or influencers. As we all know, there are numerous social media platforms available in the online market. These platforms can seriously help you out in finding a lot of details about users. Hence, there is no need to ask the details once again. It is suggested to shorten the way to access your application. You can do it by giving them an option of “Login using” or “Connect with” one of the available applications or accounts. As the market is quite competitive, getting positive results from an app of social media is quite tough. No matter how good Android or iOS app Development Company you have hired, regular assessment of the online networking is important. Go for Retweets or click through rates, in order to check your app status. No one wants to access a sluggish and error full mobile app. Hence, make sure that the app you are creating has a smooth working. Use the interface simple, but try to add advanced features. The competition is not easy, especially when there are huge a number of social media platforms. You should hire beta testers to analyze the proper working of your app. Don’t publish it directly on the market. Safety is what we all want and with the increasing cyber-crime activities, people have become more cautious. Therefore, always ensure that your social media app is as secure as it could be. Only a safe application can sustain in this highly risky market. When you begin fabricating a social media from the beginning, you need to focus on growth. Facebook was not unaware of the fact that it will gain so much popularity. Mark was ready for the development even before he was sure that he will get success globally. App developers make sure that the social media platform is expandable and can grow rapidly. There is a huge demand for iOS as well as Android app developers because of an increasing requirement of mobile apps. Social media apps are not the exception. Therefore, I have shared some key points that you need to keep in mind to build a fluid app. Previous articlePre-Launch App Marketing to Make Your App Successful!